How Can My Tattoo Be Removed? Regret is a tough thing to live with. And while some of things that we do in life that cause us regret are kept to ourselves, a tattoo can be very different. Some people absolutely LOVE their tattoos! But for others, what seemed like a great way to forever commemorate your 21st birthday or a decision to get one that was made under less than ideal conditions on a night out with friends can really be a big source of regret later on! Tattoos can keep you from wearing the types of clothes you love and even cause you embarrassment when you take off your shirt in public or go on a job interview. 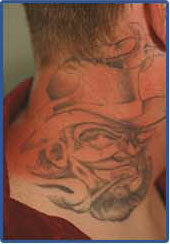 Look, tattoos have become increasingly popular in the past several years, and not surprisingly, so has tattoo removal! If you’re over your tattoo and looking to get it removed, please read on. We can help you decide to take the next step. Laser technology in the area of tattoo removal has really evolved and improved. We now have the ability to remove any tattoo, anywhere on the body, regardless of the colors in the tattoo. Caucasian to African-American, we now have lasers that can effectively and permanently remove tattoo ink from any skin type. As you already know, a tattoo is created by the injection of ink into the deeper layers of the skin (the dermis). The particles of ink are very large, and because of this, they can’t be removed by certain types of blood cells in our immune system that normally remove foreign and unwanted things from our body (like viruses, etc.). And to make the tattoo dark enough to be seen in the skin, the artist has to put a lot of ink in the skin, often times layering it. Because of the tattoo process and amount of ink used, your tattoo is considered permanent. But as you may notice, tattoos can often get dull or blurry over time. Even though it’s an impossible task, the body continuously tries to break down that ink and take it away. Engineers have ingeniously designed lasers to capitalize on and further enhance the body’s own natural tendency to want to get rid of tattoo ink. Tattoo removal with lasers is really just a way to break down those ink particles into smaller pieces that the body is capable of getting rid of on its own. Think of a chicken breast. You couldn’t pick the whole thing up and eat it in one bite, but if you cut it up into many smaller pieces, you could probably eat the whole thing in 5-10 minutes. The laser acts like the knife to break up the ink particle. At Celibre Medical Corporation, we only used lasers that are FDA-approved for tattoo removal. And it is not a one-laser-treats-all process. Different lasers with different wavelengths of light energy must be used, depending on the color of the tattoo ink and your skin. All of them, however, rely on an energy amplification called q-switching. Q-switched lasers basically send an energy shockwave into the skin. The ink absorbs some of the energy, and it will literally explode as a result. This explosion is so powerful, that it actually generates another wave of pressure that breaks up other, nearby ink particles too. This is called photoacoustic effect and it was actually discovered by Alexander Graham Bell. So yes, you can thank the creator of the telephone for part of our ability today to get rid of your unwanted tattoo! Why Does it take So Long to Remove a Tattoo with a Laser? Unfortunately, what only took a few hours to create in the tattoo parlor can take up to a year or longer to get rid of in the laser room. Laser removal of a tattoo is a long process. But, it works! And if you’re really committed to getting rid of your tattoo, we can help you by creating a plan that get help you quickly and effectively reach that goal. It’s true, it is not an overnight process. This is because it just takes time to allow the body to do its work in digesting and removing those ink particles. Another thing to consider is that we have to balance the damage we do to the ink with the collateral damage to the surrounding skin. This is a real tightrope walk! While we want to inflict as much damage as we can to the ink, we have to be careful not to overly damage the skin. This is why some people get a permanent scar from laser removal of their tattoo. That’s definitely not a trade off that you want, and really, trading a scar for an unwanted tattoo could completely defeat the purpose of seeking removal in the first place! 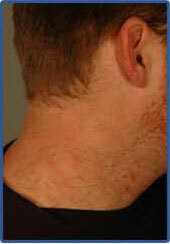 Celibre Medical Corporation specializes in the art of laser assisted tattoo removal. Our highly trained laser specialists have successfully treated thousands of people with unwanted tattoos, and we can help you with yours too. If you’ve thought about it and are ready to take the next step, we hope you will give us a call today. We would love to explain our unique and effective process of tattoo removal with you, and walk you through your customized treatment plan to finally get rid of your tattoo once and for all. How many treatments does laser tattoo removal take? Is there any discomfort associated with laser tattoo removal? Contact us today to schedule a FREE tattoo removal consultation!